Upon his arrival to London in May, it immediately became obvious that Van Gogh’s concerns about being able to maintain himself abroad were unfounded. Goupil and Cie found him a boarding house, albeit an expensive one that cost him much of his wages. The raise he received upon entering the London branch helped. His 50 guilders, the currency of the Netherlands at the time, a month would have earned him an annual salary of 700 guilders. As his annual salary in London was £90, it gave him about £7.5 to live on per month. In guilders, that translated to about 90 a month, bringing the annual salary to be about 1,090 guilders. Unfortunately, his room at the boarding house cost around 890 guilders a year without the inclusion of laundry and no midday meal (letter 9). In today’s money, it means that Vincent had an annual salary of around $10,267 or £12,834, which isn’t the best as far as wages go. Thankfully Van Gogh found other lodgings with Mrs. Loyer and her daughter Ursula, who both also ran a small school for local boys. It was 180 guilders cheaper. He could live a little less leanly. Both places were in the suburbs of London; in a letter, he mentioned that it took him around 45 minutes to walk from the Loyer house to Goupil’s branch in London (letter 22). The London branch was far less busier than the one at the Hague. It was only a stockroom, no gallery attached, so Vincent had less contact with customers and artists on the scene. He reported that his weekday hours were from 9:00 am to 6:00 pm and on Saturday he left at 4:00 pm (letter 9). No matter where he lived, Van Gogh spent much of his free time the same way. He visited museums and took trips up to see the art exhibitions. While in the Hague, he frequently went to exhibitions in other cities, such as Amsterdam. Occasionally, he would attend auctions for Goupil and Cie to find items for clients. He was a voracious reader. Many of his letters to Theo recommend books he’s read or he send them to Theo with notes on which stories he liked and why. Many of the stories he referenced were those of Charles Dickens and George Eliot. While in London, he started reading the poetry of John Keats, who was a popular subject for the pre-Raphaelite movement of painters (letter 12). Walking was a favored activity. He loved it in the Hague and especially in London. He described it as a city with “splendid parks with a wealth of flowers such as I’ve seen nowhere else” (letter 10). He almost made it a point to avoid the tourist attractions of London, specifically the Tower, Madame Tussaud’s waxworks, and the Crystal Palace, as he preferred to go to the museums and parks (letter 12). Interspersed in his correspondence are mentions of drawings that he made. He filled small sketchbooks of sights in London for Betsy Tersteeg, Herman Tersteeg’s daughter, which unfortunately did not survive (letter 24). So while bored, life in London passed very well for Vincent van Gogh. In fact, he fell in love with Ursula Loyer. Van Gogh was rather close-lipped about his affection for the young lady at the time, telling no one in his correspondence about his feelings for the girl. Furthermore, he didn’t even tell the girl until he was about to leave for a holiday to see his family in June 1874. It is only known that he did it some time before June 27, 1874, where he came home a changed man. Ursula Loyer turned him down; she was secretly engaged to her family’s previous boarder. His parents noted a change in Vincent, that he was withdrawn and pale. It was his first major disappointment, one that affected the rest of his career as an art dealer. Van Gogh returned to London on July 15, 1874 with his sister Anna in tow, who hoped to look for a job in London. These letters mark a strong shift in Van Gogh’s mindset. He left the Loyer house to the home of Mr and Mrs John Parker (letter 28). He writes little of his work at Goupil and nearly every letter starting from the 27th has a biblical quote referenced or directly written. While deeply religious and son to a minister, it was not his habit to reference the Bible so frequently. His attention shifted from art and sought the comforting refuge of the Bible for strength. Art dealing, Van Gogh felt, was no longer his calling. He grew more withdrawn, writing less to his family as a whole. Van Gogh avoided discussing problems that he was having with his sister Anna, adding, “I hope and believe that I’m not what many think me to be at present” (letter 33). It worried them, to the point where Van Gogh’s Uncle Cent arranged for him to be temporarily removed from the London branch to the Paris one in October 1874. His parents and uncle hoped it would improve his spirits. It brought no change in him, and he resumed his secluded lifestyle upon returning to London in December. A permanent transfer was arranged. Van Gogh was officially at the Paris branch in May 1875. He lived in a room that he let in Montmartre, a neighborhood in Paris famous for its artists. Most of his letters avoid talking about work at Goupil. In some he describes the exhibitions that he see in great detail. In others, he lists the paintings he has on the walls (letter 37). Religion was his favorite topic, peppering all of his letters. Van Gogh even made friends with a fellow worker at Goupil, an Englishman named Harry Gladwell, who seemed to have as strong a religious fervor as him (letter 55). It seems that Van Gogh took Gladwell under his wing; they roomed together, ate together, read together, Van Gogh “guided” him in his tastes of paintings. It was as if he had a regular little follower. 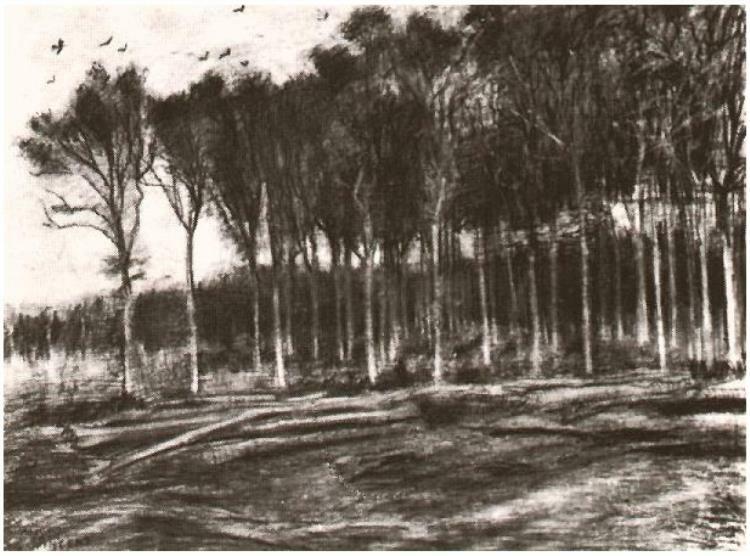 The bright spot Gladwell created for Van Gogh in working at Goupil did not save his career. Intending for months to visit his parents at their new parsonage in Etten during Christmas, Van Gogh went through with his plans, fully knowing that it was the gallery’s busiest time. On January 4th, Mr. Boussod, the man who ran Goupil, called Van Gogh in to inform him of his three month notice and Van Gogh would be expected to leave April 1st. 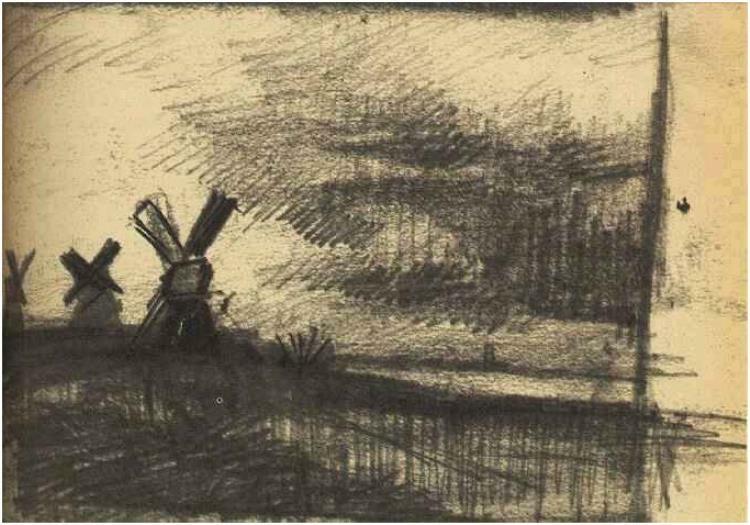 None of the following letters show Vincent to be much upset by his loss of a job at age 23. In fact, there is almost a hint of relief. His letters are effusive if uncertain about what his future plans are. There is no regret or resentment in his words, even as he mentions that Gladwell is being trained to take his position in the gallery (letter 71). His time at Goupil and Cie had simply ran its course. While his parents plunged into worry, Vincent simply dreamed of his new beginning.